The Caverns of Ely is a long narrative poem which moves among a number of world: a mythical underwater realm, a village in Cambridgeshire, England, a coral reef in Belize, and a spit in the south shore of Cuba. Myth, history and present reality converse together in a poem which looks at themes of love, courage and archaeology. This limited edition chapbook ( 32pp.) 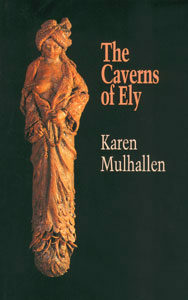 is published by Pasdeloup Press (1997) with a cover illustration from a terracotta sculpture by the press’s proprietor, author, publisher and visual artist, Virgil Burnett. The chapbook was printed in Erin, Ontario, by The Porcupine’s Quill. and led me to his garden grove. but above or below, all doomed. Whom might I tell whom the telling might not destroy? against these are the horses.